The UK pet insurance market has continued to see significant growth, with gross written premiums (GWP) increasing by 7.1% to £1,045m in 2016, according to GlobalData, a recognized leader in providing business information and analytics. The company’s latest report: ‘UK Pet Insurance: Market Dynamics and Opportunities 2017’ reveals that medical inflation remains the underlying factor driving GWP upwards, with technologically improved quality of treatments and procedures being applied more commonly and driving inflationary pressure on claims costs. This has resulted in claims incurred figures outgrowing GWP, with a 7.4% increase in 2016. Product penetration has also risen, but at a considerably slower rate than GWP or claims incurred, with the number of subscribers increasing by just 2.0%, to reach 3.4 million in 2016. The pet insurance market continued on an upward trend with regards to market size in 2016. Strong growth in GWP was seen yet again, but the market remains blighted by significant increases in the number of reported claims, which grew to record levels. 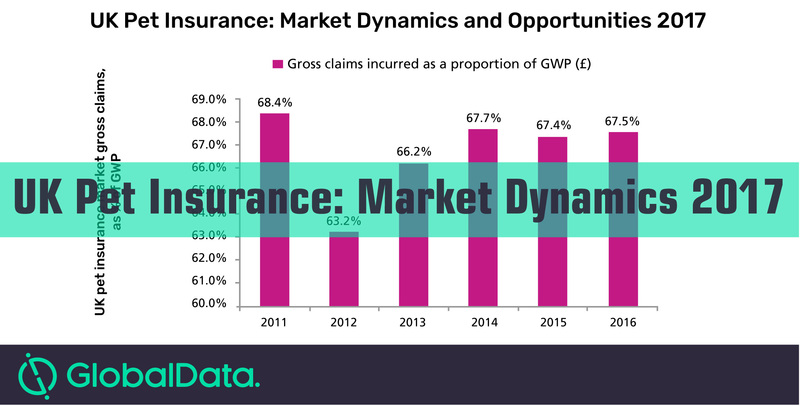 The ongoing growth in GWP has been driven by the response to a tough claims environment with rising prices, as insurers look to improve returns and generate better business. For some brands, comparison sites are now the main distribution channel for pet products. A side effect of aggregators’ growing influence has been increased education, with consumers becoming more aware of the differences in policies as benefits are listed. However, less positive is the risk of reduced customer satisfaction, as there are often additional costs hidden in the small print that are incurred later on, perhaps not flagged as clearly as in other channels. One emerging trend is the insurtech wave gradually reaching the pet market. The pet sector has been one of the slower lines to embrace change, with fewer apps and slower uptake of online aggregators, but the last 12 months or so have seen more technology emerge in the sector. One example is PitPat, a Fitbit equivalent for animals that can be used for both finding pets and tracking exercise and calories burned. The step tracker could lead to reduced premiums in the same way Fitbit has for health insurance.